Another image from the spectacular Bridgeview Yacht Club in Island Park, Nassau County, New York. This amazing venue, convenient to both Long Island and New York City (NYC) has it all. 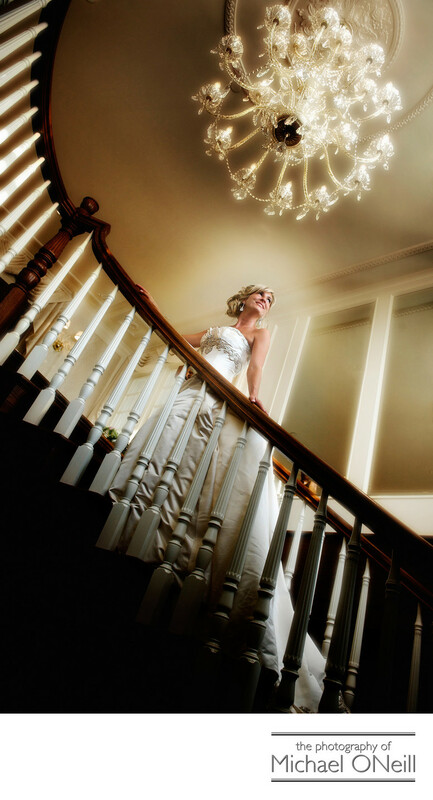 Pictured is the stairway that rises from the elegant lobby to the upstairs bridal suite and photo area. My stunning bride, Amy, looks absolutely breathtaking in this spot. Downstairs is a wonderful bar/reception area overlooking the water where your cocktail hour will be hosted. A few steps down the corridor leads to a wonderful, private garden area that is perfect for wedding pictures. At the end of that corridor is one of the most contemporary, elegant ballrooms in New York. And we haven’t even stepped outside yet where a private boardwalk on the waterfront creates the perfect backdrop for sunset or night time pictures. I have shot many weddings at Bridgeview Yacht Club in my career and have all the experience needed to insure that your wedding photos will be as beautiful as you imagine. Give me a call and we’ll talk about your plans for your Bridgeview Yacht Club wedding celebration.